When I walked out in the early dawn this morning to do chores, I turned to admire the near full moon as it approached the western horizon. As I turned, I noticed a cow standing beneath the moon. One might think that a pleasant sight to see on a farm, if it weren’t for the fact that particular area of the field is a restricted area to livestock. The livestock have been stuck in the barnyard since winter began. This allows them to be closer to food, water, and shelter as well as protects the pasture allowing it to grow more quickly once spring arrives. Two of the cows managed to push through the temporary fence we use to separate the barnyard and couldn’t manage to find their way back through. Apparently they were tired of their posh accommodations, hoping for something more amenable on the other side of the fence. The joke was on them though. Thanks to a continued covering of several inches of snow, there wasn’t much to be found. Thankfully I found a gate I could pry from the snowdrifts and frozen ground and herded the cows back through rather easily. It was a little tougher to mend the fencing but hopefully the patch will last another month or so until they can get back out on pasture. The farmers will be on a break this weekend attending to other obligations but we will be sending Farm Intern Amy to manage the market stand. 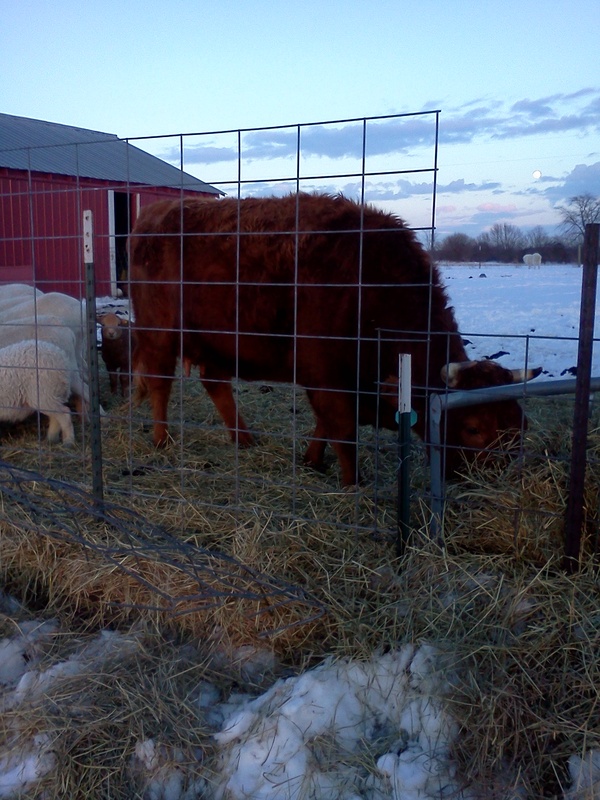 She’ll be at the Farm to Fork Market at Normandy Farms on Saturday, February 15. Amy will be bringing pastured pork, pastured chicken, Paleo Almond Delight Power Bars, Paleo bread, and Primal chocolate cupcakes with traditional buttercream icing.